Here is a quick blog on another big update to Topaz Studio. This time the program now includes an Adjustment Panel for Impression. The interface is very similar to what is in the older Topaz Labs Impression2. It actually is easier to understand compared to the Clarity update (see my Updated Clarity Now in Topaz Studio blog for more on this) which included two adjustment panels working together. And the same great Topaz policy stands so if you already own Impression, it will be updated for free. As I said in the Clarity blog, before going any further, please be aware that Topaz is not going to update the actual Topaz Labs version if you own it. Instead it will be updated in Studio (to download go to my Tidbits Blog sidebar and for more info check out my see my Introducing the Free Topaz Studio blog) before adding the Impression update. If you have Studio already running, just go to the website to find the Impression update by clicking this link. The addition of a Painting Progress Timeline slider which “…allows you to move forward and backwards through the development of the Impression effect added to your image.” Using it will give some very different effects from what the full application of the paint strokes creates. Increased the resolution of any image larger than 2k. Increased detail in every brush stroke. Must compare with the Topaz Labs version to actually see this difference. Just like with Clarity for Topaz Studio, Impression can be opened from the the blue Adjustments button, the Adjustments menu in the top bar, or from the Specialty section in the pop-out on the left side of the interface – down at the bottom Impression will be listed along with the new updated Clarity if you own it also. I know some people are enjoying have the presets all in one place, but I am still having problems with organizing My Effects presets so I can tell which ones go with which adjustment. By clicking on the three bars at the bottom of the preset and selecting Edit, the name can be changed so I am now adding a TI to all my Impression presets and TC for my Clarity presets. Brush Size – Very small size protects the detail in image; large size blends detail so less noticeable and more painterly. Paint Volume – Individual strokes show highlights and shadows; increase size for an Impasto look. Paint Opacity – Transparency of the strokes (more background comes through). Stroke Rotation – This slider adds variation to each stroke and when combined with Stroke Color Variation some very interesting texture results can occur. Stroke Color Variation – This introduces different shades of color in image – the color changes drastically when set really high. Stroke Width – Set to 1.00 the stroke is scribbly and -1.00 very realistic. Stroke Length – The large the amount, the longer the stroke. Spill – Use to make edges of edges more painterly – set to 1.00 and the paint spills over edges as an outline. Smudge – Burs and smooth edges of strokes – set to 1.00 and it looks like PS Oil Paint Filter. Coverage – How far the medium is spread across the surface – when set low the background shows through. Coverage Transition – Only appears if Coverage is used – set to a lower amount and it becomes a white vignette. Painting Progress – The new slider that can be reduced to take the actual stroke layout to an earlier stage. Really fun slider to use. Remember that to add a Vignette to an image, in the Lighting section move the Vignette slider and more slider appear to further add alter the effect. Since Topaz Studio does not support Photoshop Smart Objects, there is now a .tsp file format that will save the settings used in the layer so you can go back and see what was done to the layer – just go to File -> Save and in the drop-down name and save as a .tsp. This will save the layer even when opened as a plug-in in Photoshop – just click OK as before to apply the layer. 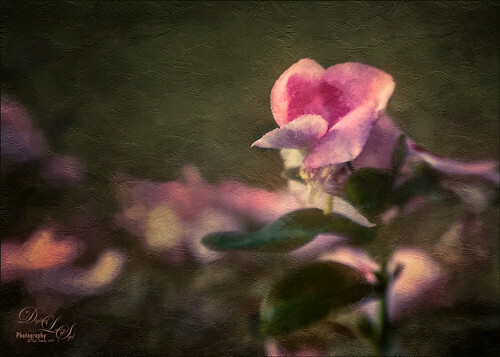 The image above is a pink Vinca flower where Impression for Topaz Studio was used on two different layers. Each time the default settings were used and the mask was opened and different areas were painted out. It can be added into the same image as many times as you want with different preset effects or settings – or the same! Then individual adjustment masks can be opened and the actual effect can be localized to a certain part of the image just like individual layer masks work work in Photoshop. This image used the Painting Progress slider set to 0.71 for the first use of the adjustment. After the Impression Adjustments, a Texture Adjustment not in the Impression panel was added where one of my textures was used to give the more Impasto effect – just painted out the flower and foreground leaves to soften this effect. Last step was to add a Dual Tone Adjustment to really bring out the highlights on the flower. 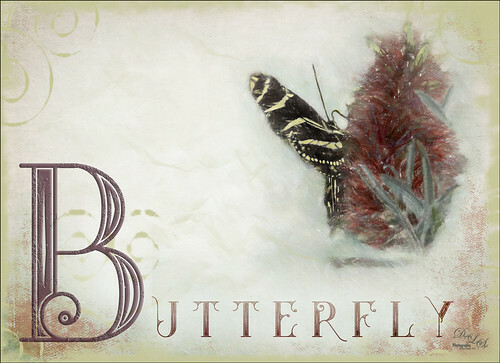 In this image of the Zebra Longwing Butterfly, Topaz Studio’s Impression Adjustment was applied twice on two different PS layers. One used my charcoal presets with the Paint Progress set to 0.43, and the second started with the default settings where a little more color was added using the Impression Adjustment. This entry was posted on 09/23/2017 by sydspix. It was filed under Photoshop Filter, Topaz Studio and was tagged with Impression for Topaz. Beautiful dreamy flower. Love the purples and greens in the picture.